A triangular trip of three main tourist attractions; Kathmandu, Pokhara and Chitawan. A religious and cultural journey within Kathmandu Valley. Lifetime experience of sheer natural beauty and panoramic views of Himalayan ranges from Pokhara. One of the Asia’s best managed Chitwan National Park , shelter for over 50 species of mammals, 55 species of amphibians and reptiles and 525 species of birds. Afternoon - Patan Durbar Square. Afternoon - Jungle Safari on an Elephant Back, explore the jungle and the wildlife. Evening - Slide show on flora and fauna of the Chitwan National Park. Folk dance performance by local tribal group. Drive to Pokhara. Leisure time to spend on your own. Morning - Hike to Sarangkote hill. Afternoon - Boat ride on Phewa Lake. 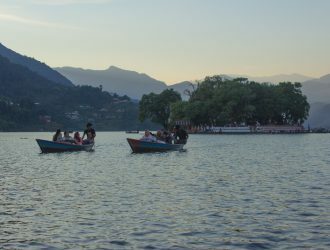 Half day sightseeing tour of Pokhara town. After breakfast, Drive back to Kathmandu. Leisure time to spend on your own.